This story of an anti-fascist’s dramatic and remarkable victory against Nazism in 1935 is an inspiration to anyone compelled to resist when signs of oppression are on the horizon. Just days after violent anti-Semitic riots had broken out in Berlin, the SS Bremen, the flagship of Hitler’s commercial armada, was welcomed into New York Harbor. Bailey led a small group that slipped past security and cut down the Nazi flag from the boat in the middle of a lavish party. A brawl ensued, followed by a media circus and a trial, in which Bailey and his team were stunningly acquitted. The political victory ultimately exposed Hitler’s narcissism and violent aggression for all of America to see. 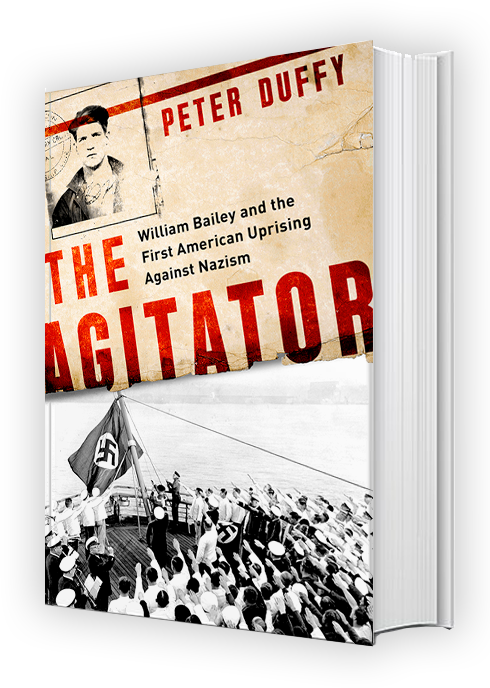 The Agitator is the captivating story of Bailey’s courage and vision in the Bremen incident, the pinnacle of a life spent battling against fascism. Bailey’s story is full of drama and heart–and it’s an inspiration to anyone who seeks to resist tyranny.